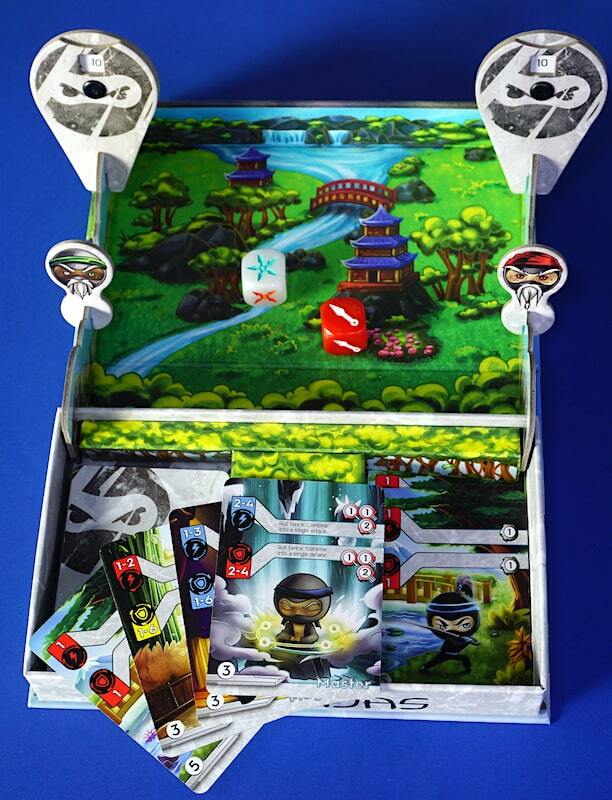 Duel to the death with a cast of unlikely-looking ninjas in Tiny Ninjas, a game of cards and dice by Ryan Leininger, published by 2niverse Games. It’s also one of Asher’s favorite games. Listen to him explain why he likes it, or read on below. Draw a starting hand. Choose a sensei. Prepare to fight! Unfold the box and insert the special side pieces. These form a dice tray and also a place to hold your health dial and sensei ability marker. There’s room for two stacks of cards – one is the Dojo (draw pile) and the other is the Arena (discard). Each player starts with 10 health and a hand of 5 cards. The younger player decides which player will attack first. The attacking player plays one card and performs the associated ability and/or die roll. THEN the defending player may choose to play one card to defend against some or all damage. Sometimes this also requires a die roll. The attacking player may take as many attack turns as they wish. When they decide to stop, the Defender and Attacker switch roles. 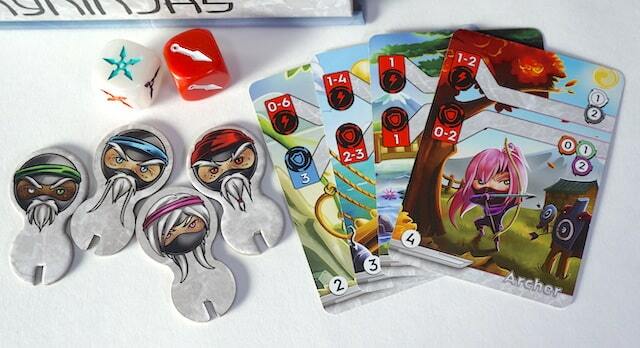 Before switching roles, the Defender “trains” new ninjas, drawing back up to 5 cards in their hand. The Attacker does not get to replenish their hand. They must defend with only the cards they have remaining, leading to an important tactical decision: how many cards to use for attacking, and how many to keep back for defense. Tiny Ninjas is a straightforward dueling game: take turns attacking and defending, and whoever runs out of health first, loses. What makes it stand out are the dice and special abilities. Dice make the game unusual. 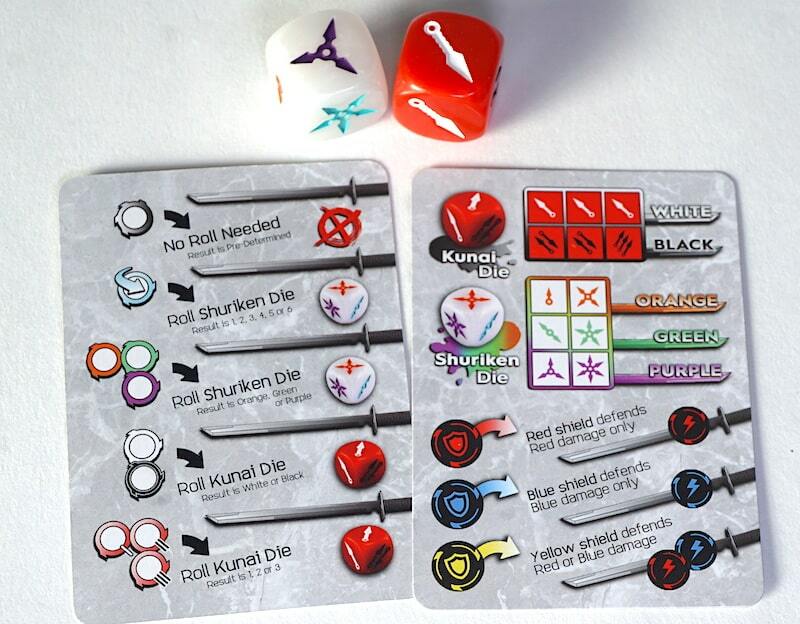 Many cards require a specific type of die roll; the kunai die (red) has a 50/50 split on color (black and white), with 3 ones, 2 twos, and a three. The shuriken die is numbered 1-6, evenly split between three colors (purple, orange, teal). This allows each card to present attacks/powers with very specific probabilities in an intuitive way. Tiny Ninjas also presents an intuitive solo mode for playing on your own. After removing a few specific cards from the deck, you begin as the attacker. Play your attack card, rolling a die if necessary; then the “CPU” flips the top card from the deck to use as their defense. When you decide to stop attacking, it’s the CPU turn. Flip the top card and follow its instructions for attack. Then choose from your hand how to defend, just as in a two player game. The CPU always attacks exactly three times on its turn; use its sensei marker to keep track. Attacks come in two colors: Red and Blue. Defense comes in three: Red defends against Red damage, Blue defends against the rarer Blue attacks, but Yellow defends against either kind of damage. Attacker plays Panda and rolls the die: 1 red damage. Defender plays Solo to defend 1 red damage. You may also choose which of four colored senseis to represent your side. Each of the four has a special ability that can be used once per round, such as blocking some damage, healing a small amount etc. Use your special ability up to three times in the game. Use the slots on the sides of the arena to keep track, of course! This is currently Asher’s favorite game. He loves being able to play it solo, either at home or in the car. Easy to transport, plays right in box. It’s a solid head-to-head game. 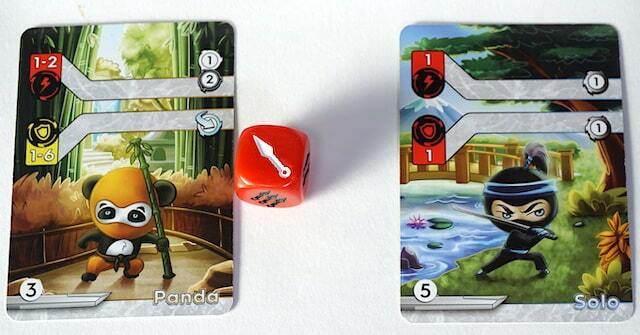 The box and dice design bumps it further up in our ratings. We give Tiny Ninjas 4/5 ninja stars. Find it on Amazon, or ask for it at your local game store. 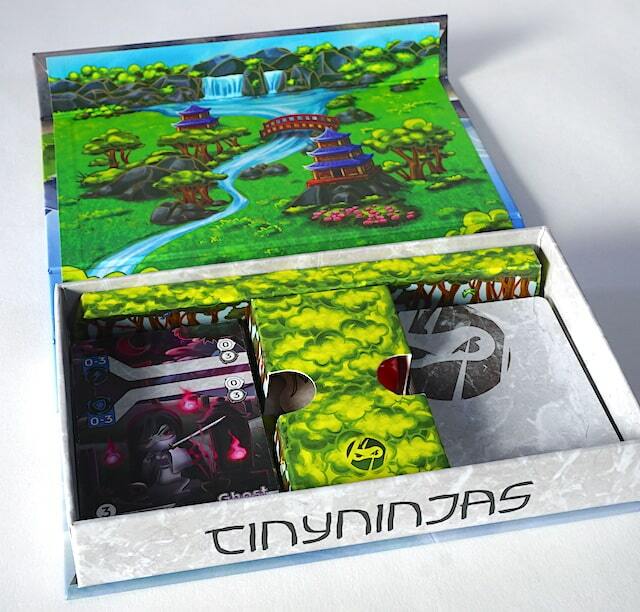 The Family Gamers received a copy of Tiny Ninjas from 2niverse Games for this review.